Film and Television Production: What Would Ryan Lochte Do? And so this slogan kicks off the first season of the 11-time Olympic medalist’s show, and indeed, we’ll have to see. My post is an honest point of view on E!’s new show, and I must warn you, there are spoilers. The viewer is first introduced to his group of close friends, which include his assistant and brother. They do “cool” things like play flag football and drink at Ryan’s place. Then, the most annoying element of the show is introduced, and that would be his signature phrase, ”Jeah.” It’s like a bad pop song from a one-hit wonder that you just can’t stop mumbling. I must say though that the few scenes that include his swimming life are the most appealing. That’s probably because as someone who swam competitively for many years, they are relatable; from an editor’s point of view, they don’t feel fabricated and they flow smoothly. The Lochte clan is then introduced at his family bowling alley and Ryan makes it clear that family is the most important part of his life. It is so important, that an emotional scene could not be absent. Then again, you can’t have a good reality show without some drama and conflict. Ryan Lochte crying for the first time in front of the camera! This completely threw me off. You’re being introduced to this 28 year-old guy who to me, seems like a high school sophomore trapped in a ripped body, and then all of a sudden we’re taken to a crying scene. This should have been left until the end or should have been saved for another episode with more depth and emotion. This completely threw me out, but I must say it made me laugh out loud. The sushi date was funny, mainly because we know he is not looking to settle down, even though he claims true love is what he’s looking for. They bring this up way too much to the point that it feels overly manipulated. I wrote the first paragraph as I first started watching the show, but I think I got a chance to see in 30 minutes what the show will more than likely be about. Swimmer, wannabe rockstar, trying to find his place. I think I had enough with one episode and I highly doubt this show will get renewed for a second season. Honestly, I wasn’t expecting much, but it’s sad to see your high school idol be part of a show that feels like a copy of previously existing shows. Ryan tries too hard to the point that it doesn’t feel real and organic, and it’s obvious that ideas will run short. If you’re a young swimmer trying to get into the life of your role model, this is not the show for you. But if you watched Jersey Shore religiously, be my guest. Catch What Would Ryan Lochte Do? every Sunday on E! Entertainment at 10/9c. 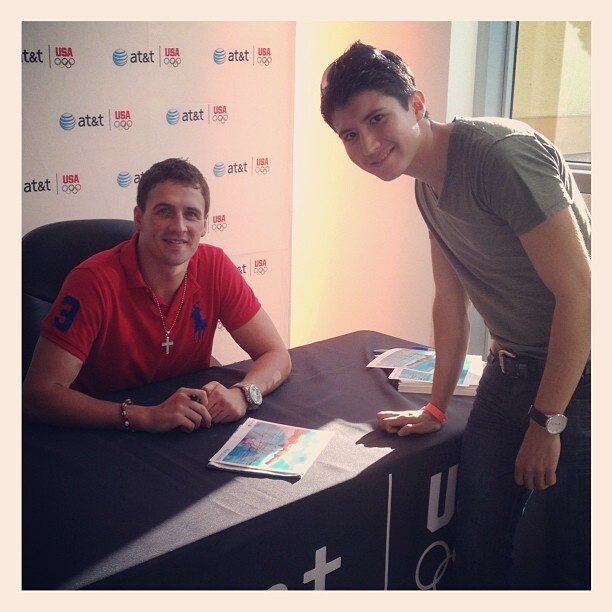 Ryan and I at an autograph signing in Orlando, FL. I told him I liked his watch... Jeah!